This paper explains the problems associated with using the funding information on the Web of Science (WoS) to determine how research has been funded. Funding sources have been added to the WoS as searchable fields since late 2008. However a funding source can have several different names and can appear with different conventions for abbreviation, punctuation and format. We needed to have one name for each source and it was convenient for names to have the same format. We therefore use a coding system, which is described in detail. It identifies most individual funders, and gives their country and sector (public, private-non-profit, commercial or international). Some of the commercial funders listed are false positives as they have paid the author(s) for unrelated work. In addition, acknowledgements implicit from the addresses also needed to be coded for public, charity and commercial laboratories. These two sets of codes were then combined to permit a detailed analysis of funding for each country by means of two Excel programs. 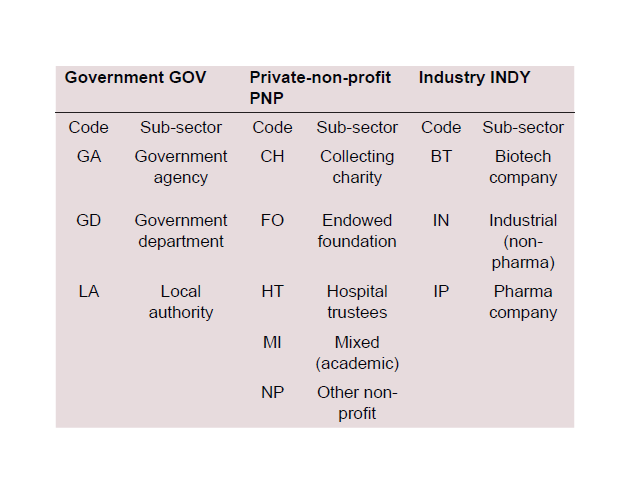 Table of sectors and sub-sectors for research funding agencies with codes. Begum M, Lewison G. Web of Science Research Funding Information: Methodology for its use in Analysis and Evaluation. Journal of Scientometric Research. 2017;6(2):65-73. doi:10.5530/jscires.6.2.12.